"These guys are coming after you…!" Cinedigm has released an official trailer for a new crime thriller titled Gangster Land, from director Timothy Woodward Jr., of the western film Hickok also being released this year. Not quite Gangster Squad, not quite The Godfather, this indie mob film follows Al Capone's second in command, "Machine Gun" Jack McGurn, as played by Sean Faris. It tells the story of Capone's rise, but through the the eyes of McGurn. Milo Gibson (one of Mel's sons) plays Capone, and the full cast includes Jamie-Lynn Sigler, Peter Facinelli, Michael Paré, Jason Patric, Don Harvey, Mark Rolston, and Al Sapienza. This actually looks better than expected, but doesn't look like a knock out either. Take a look. The story of America’s most famous mobsters and their rise to power, Gangster Land examines Al Capone's ascension through the eyes of his second in command, "Machine Gun" Jack McGurn (Faris). Once an amateur boxer, McGurn is lured into the Italian mafia after the murder of his step-father. Upon joining, he rises swiftly through the ranks along with friend and eventual Boss, Capone (Gibson). As the Italian mob becomes the most lucrative criminal organization in the country, tensions build with "Bugs" Moran (Facinelli) and the Irish mob which ignites a brutal gang war culminating with the St. Valentine's Day Massacre. 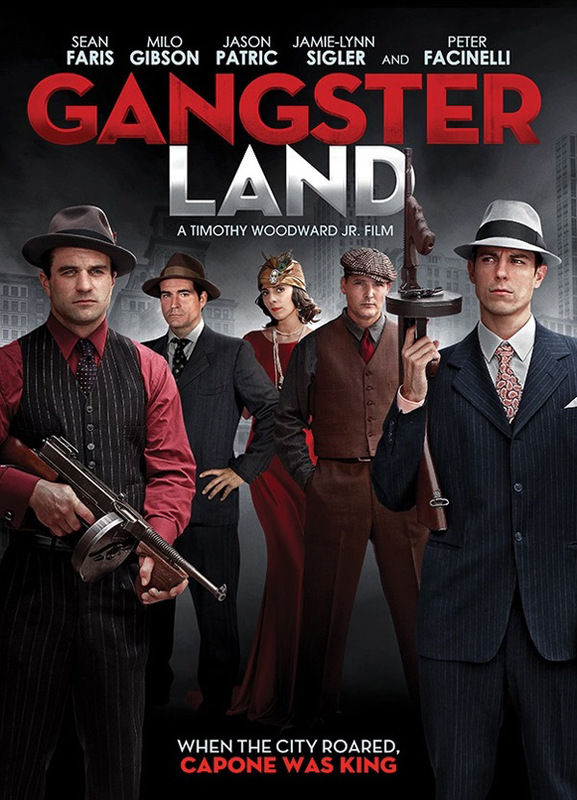 Gangster Land is directed by American indie filmmaker Timothy Woodward Jr., of the films Throwdown, 7 Faces of Jack the Ripper, SWAT: Unit 887, Checkmate, Decomissioned, 4Got10, Weaponized, Traded, and Hickok previously. The screenplay is written by Ian Patrick Williams. Cinedigm will release Gangster Land in select theaters + on VOD starting December 1st this fall. Anyone interested?